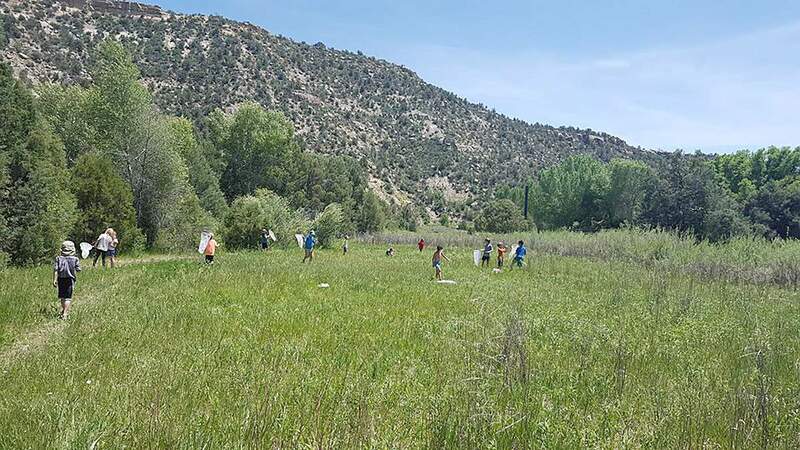 Campers at the Durango Nature Center catch bugs. A study shows that children who are in nature each day are more physically active, more aware of nutrition and more civil to each other. Almost every parent I talk to struggles with the same issue in the summer – how to keep their kids off electronics. Studies have shown that a connection between children and nature is one of the essential components to a brighter future. In fact, it has been shown that this connection may be one of the key factors in improving public health, education, economics as well as human happiness. The benefits of being in nature are enormous and include increased imagination, problem-solving skills, self-confidence and the ability to focus. Another study shows that children who are in nature each day are more physically active, more aware of nutrition and more civil to each other. And, on top of all this, children who are involved in environmental education programs increase their science testing scores by 27 percent. However, the pressures on children to stay inside are great. The lure of electronics, the busy pace of our lives, the lack of funding for environmental education programs and the dearth of green space in some communities all contribute to children not spending enough time in nature. This is also a problem for the environment itself. Children who do not learn to understand and appreciate nature do not have the same drive to preserve it or consider it in the future. The kids who are building forts, river tromping and playing “Ecosystem Olympics,” at the Nature Center don’t need to worry about statistics. They just know they love their days and feel tired and happy at the end of them. Bring your kids to the Nature Center on Saturdays as a way to connect to nature as a family, or participate in one of our family workshops. We have a birding and fly-fishing workshop going on this Saturday. As a nonprofit that so many in the community generously support, Durango Nature Studies has a responsibility to connect children with the natural world. And, there is nothing we’d rather be doing. Durango Nature Studies will host back-to-back events Saturday: The “Birds of the Nature Center” workshop will be held from 8:30 to 10:30 a.m. at the Durango Nature Center, followed by a fly-fishing workshop from 10:30 a.m. to 12:30 p.m.
Aimee Way, wildlife biologist, expert birder and DNS board member, will teach the birding class. Participants will learn about songbirds and raptors that use Nature Center habitat. They will also learn how to identify the birds by song and sight and the types of habitat the birds prefer. All levels of bird enthusiasts are welcome. Binoculars and a bird book are recommedned. Entry-level binoculars will be available for loan if needed. The fly-fishing workshop will be taught by Jake West, an avid fly fisherman and DNS board member. He will teach the basics of fly fishing and discuss bugs, fly-tying and fishing techniques and tips. Casting lessons will be given in the meadow before fishing in the Florida River. The workshop is designed for people new to the sport and would be a good refresher for more experienced fly casters. The cost of each workshop is $10 for non-members and free for members, and all participants receive free entry to the Nature Center for the day. To register, call 769-1800. For directions to the Nature Center, visit www.durangonaturestudies.org.